Was at Kadena 1956-1958. Went thru seven typhoons. Worked in communications. The first day of my first typhoon got word that my son was born in Toledo, Ohio. Remember Koza and New Koza very well. Thank you for visiting ClickOkinawa.com and for your message. I remember the typhoons like they were yesterday - and pretty good memories over-all. Usually meant a day or two of not having to go to work! But, unless we got prepared well in advance it turned out to be a lot of work cleaning up afterwards! Too bad that you were overseas when your son was born, Edwin. Now-a-days it's a lot easier than when we were over there, huh? With e-mail and Skype and other media sites a guy can stay closer to family without the huge expense of overseas phone calls or the hassle of MARS calls. I was in France in the 1960s and letter-writing was the only means of staying in touch with family and friends back home. I remember when I was on Okinawa in the 1970s I would make audio tapes and send those along with snap-shots. That was "high tech" communications in those days. Well, it's good to hear from you, Edwin, and please feel free to contact again any time. If you have some photos or stories to share of your time on Okinawa don't hesitate to ask - I'll certainly post it on the website! Interestingly, when I saw the solution, I was encouraged to dig up a picture of Maeda Escarpment that I took in 1966...very roughly a mile northeast of the escarpment. Just a few feet to the right of Route 5, as one drove south, beside a sugar cane field there was a very small monument to Desmond Doss, 77th Infantry Division, MOH. (As a Boy Scout in 1945, I had marched in his homecoming parade in Lynchburg, Virginia.) If you don't have a photo of the monument, I'll copy and send. Can't get my scan working properly. The monument was about the size of an old-fashioned 21 inch TV and sat atop a three-tiered pedestal. The whole thing was no more than five feet tall and was showing signs of some damage. The distant view of the long, flat escarpment looks a bit more like New Mexico than Okinawa. Between the roadside monument and the escarpment are sugar cane and other fields. No homes or other buildings. For a while in 66, we lived in Gibo, near the police box, and drove Route 5 frequently. (From Gibo, it was only a short walk to Ryudai where I moonlighted by teaching a class of adults who were preparing for the scholarship exams leading to U.S. graduate study.) You'll appreciate that two doors from us lived a very old woman, reputed to be about 115, who had been a small girl when Perry visited Okinawa. I'm tempted to go on and on, but it's about nighty-night time here in central Virginia. Thanks for all the superb work you do. Your note reminds me of something I had planned to do quite some time ago then (obviously) forgot to get accomplished - that is to do a tribute page to Desmond Doss. It was fun helping Susan Silva identify her friend's location but wouldn't want to take that up as a matter of routine. I think I just got lucky with that one. I can only imagine the fascinating tales that your neighbor was able to tell about her witnessing of Adm. Perry!! Wow! And, thanks to you, Warren, Desmond Doss will get his feature on ClickOkinawa. I told a friend (who lives about a hundred miles from here, near Lynchburg) about your search for the original Desmond Doss monument. My friend, a history lover, was at the Campbell County (Doss's home county just outside Lynchburg) Museum on unrelated business. He was shown their small Doss display and mentioned to the museum's kahuna your successful search for the original monument. Instant interest. (He was a Marine lieutenant in Vietnam.) I told my friend that when I came down to visit, I'd bring copies of what you'd found. So...I made good 8x10 copies of your photos, a good copy of a small map showing the advance on Shuri, and the introductory sheet (that explained the process of collaboration with Mike Mingin on Okinawa who located and photographed the monument). I was a Missile Crewman stationed at the Nike Hercules site on the Marine Corps Air Facility Futenma on Okinawa during '67 and '68. It was a very busy, often stressful time, but I loved the people - got to know one of the native guards (and his family) that manned the gates with us. You and your readers might enjoy this story. There was a recreational facility that provided tape recorders and a large library of tapes and records where servicemen could make personal copies. I enjoyed going up there when I could - I think I still have a reel of Frank Sinatra songs. This facility was maybe about 1/2 mile down the beach from the west end (China Sea end) of the Kadena Airbase runway - you could hear the planes taking off. One day while waiting for a recording to finish (about 45 minutes) I took a walk down the beach to the runway. From my vantage point I could look straight down the full length of the runway. While sitting there, the thunder and roar of B52s began. Only the top of the huge tail fins (rudder) could be seen above the high earthen berms that surrounded the plane parking area, and soon they started to move. Shortly the nose of the first one appeared from around the berm at the far end (about 2/3 mile away). After exiting the protection of the burm it turned onto the runway towards me and immediately began accelerating down the runway for takeoff. It was followed immediately by 10-11 more fully loaded B52s with their wing racks loaded with bombs. I was looking straight down a runway filled with a staggered line of thundering B52s - talk about a sense of shock and awe! What a sight and sound - and smell! This amazing sight was startling to me because it looked like the B52 wings with their loaded bomb racks (destined for Vietnam) were almost flapping like a bird! I learned that B52 wings are so long and flexible that they normally droop down when on the ground and they have to be supported at the ends with struts (like little landing gear). As the B52 accelerates for takeoff, the wings start to get lift and then they literally flap a little as they start to lift off the ground; eventually they rise up and lift the whole plane into the air. BUT, looking head-on down this line of B52s I could see all these wings with bombs flapping and waving and shaking those bombs, and the ROAR of all those jet engines - stunning! I was so impressed with this sight, I decided I had to get some pictures. So the next time I went to the recording library, I took my new Nikon with telephoto lens (great deals at the PX on Japanese technology, Sony, Nikon, etc.). Sure enough, there was another stick of B52s. And, man, did I get some incredible photos - with that telephoto lens compressing the feeling of distance and capturing all of those bombers - awesome. As I turned to watch the last B52 go overhead and head out over the China Sea towards Vietnam I heard a siren behind me. I turned around to see an MP jeep coming down the runway toward me with lights flashing and siren blaring. The MP pulled up, asked for the camera, opened it, took the film, returned the camera and calmly said, "Don't do that again." And drove away. Oh, well! So, you'll have to take my word for it - it was a sight I'll never forget. I never saw another B52 stick take off, but I did see a couple take offs of the SR71 Blackbird recon plane - also very impressive! When it took off and landed it was accompanied (flanked on either side) by a couple of F4 Phantoms, which were the fastest fighters in the world. They took off all together side by side. When they cleared the runway, they'd pull up vertical and start climbing with afterburners at full throttle. Then the SR71 would pull away from those Phantoms like they were standing still! It was gone in a flash. Wow. Mick I just love your site. 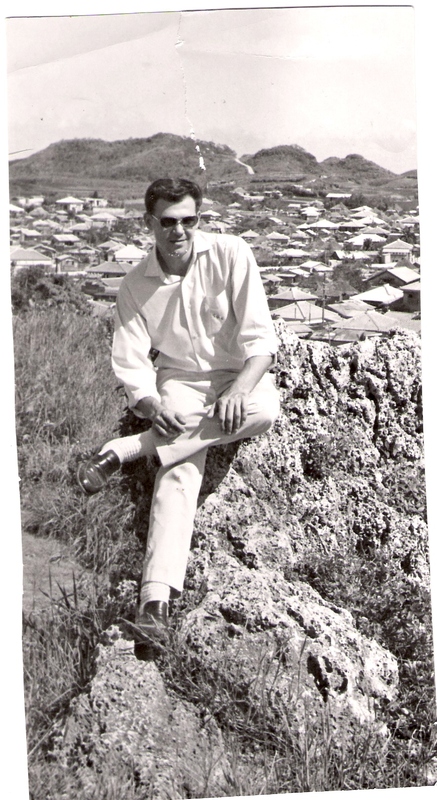 I visited Okinawa in the 70�s and fell in love with it. Your scrapbook and all the information is just marvelous. It is a small world and I was talking with a good friend who said her husband had served in Okinawa in the 60�s. He has a great picture of himself but isn�t sure where it was taken. I am going to Google earth to see if I can locate it for him but I am wondering if I send it to you could you give me your idea of where you think it was taken��. His wife wants to surprise him with the photo and the location of it! Love the music too, and yes it is a small world cuz you are in Montana and I am in Spokane Washington. Thanks for visiting ClickOkinawa.com and for your kind comments about the website. I've tried to make it a pleasant, fun and instructive resource and, as you may have noticed, toned-down with regard to the great Battle in 1945. Funny that you should mention the Scrapbook - I'm in the process of restructuring it. I did the original design back in the mid-to-late 1990s and at the time thought it was "cool" to have a bunch of glitzy HTML tricks. Well, I have recently taken "The Tours" and have found them most disappointing and, in many cases, wrought with dead links, clumsy hand-offs to other sites (many of which don't even exist anymore), and other such frustrations for readers/surfers. Please stay tuned because I'll be giving it a major overhaul these next few months. Now that I have fully retired I have time; something that was a rare commodity back "in the old days" of my practice. I'd be delighted to take a look at the photo. Please do send it along and I'll do my best to try identification. I look forward to the challenge! We've been through Spokane a number of times since our sons are in Bellingham. Nice to be in touch and please don't hesitate to visit often and even provide feedback, suggestions, corrections, etc. Thanks so much for responding Mick. I am so excited that you may be able to help me identify this location. Lots of stuff changes but the hills/mountains and the road should still be pretty accurate. I have tried to google and see if I can figure this out. I really think it looks like the south of the island. I think your site is awesome. All of the internet stuff needs to be cleaned up as it changes so fast! But what I love is reading all the experiences that people had there. I was only on the island for about 3 weeks but totally fell in love with it. I would love to go back even though it has changed a lot (as we all have). It is such a beautiful place, and so revered because of the war. I also enjoyed your library and I've read some of the books. I will keep my eyes open for any books. Hey next time you head to Bellingham, as you pass by Liberty Lake (further definition redacted for Susan's privacy), that is where I am!! Again thanks for responding and I hope you can help solve this mystery! Click on image to see full-size. Click "Back" to return to this page. Well, this is going to take some time and assistance from abroad. As you (know), I am in Montana now so can't get around the island like I did for 7 years before. May I have your permission to post this photo where others, many of whom are still on island, may see and perhaps help in the identification? I'm going to go through many of my own resources and see if I can identify the terrain but I'd like to have many more sets of eyes on this photo. By the way, I love the white socks and loafers! I'm from the same "ilk" though I'm probably 5-10 years younger than in this photo. Let me know what you think about sharing it - full photo credit will go to you. By the way, do you mind having your email address published on the website? I'm going to include our "conversation" but whether or not your email address is made public is ENTIRELY up to you. Mick that would be absolutely great! You have my permission! I think the more people who can look at it, the better (chance) we will have of identifying it. It would be so special to be able to do this for my friend. You can post this email ssilva[at]cvsd.org, or my home at Woody2947[at]msn.com. This would really be wonderful and I appreciate all of your help! I really do think that someone who lives on the island may have a better idea as to where this is. Lots of things change and of course Okinawa is more populated now, however the mountains/hills and that road should still be identifiable. And yes, that picture is certainly a "James Dean" moment! I too love the hair, the white socks and loafers. He is a handsome man and just a wonderful friend. Too bad he isn't wearing a wrist watch. If we could know what time of day this photo was made we could at least have a handle on what direction we're looking. I'm going to assume it was taken in early afternoon to begin with; the sun to his left (west), thus he'd be facing north to the camera and the background would be to the south. We'll go with that for now and see what happens. 'Sandy' says, I want to say southern Okinawa, maybe Tomigusuku (Naha) area? The hill behind him is common enough, but the number of buildings in the valley below makes me think it was the "suburb" to a larger city. 'Jeff' says, My guess is somewhere near "Hacksaw Ridge" on the southern part of the island based on the topography of the valley in the background...one of the few places the ridgeline runs East-West on an island where the geographic features tend to run North-South. Hope this is helpful. Email sent Apr 24, 2012 @ 10:37a.m. I think I have some good news for you. Check this out: Reasoning for why I think we got it. 'Anne' says, Wow -- I am so impressed. What a treasure these (Facebook) walls are and all the folks that are willing to get involved in solving the "mysteries" that come up -- I love it! I know Susan will be excited to see this! This is just awesome and it does look like the spot. The angle is different, but the similarities in the landscape and the mountain ridge makes sense. I am trying to Google to get a visual but can't find the ridge. Futenma is easy enough. The other visual indicator is that the picture was taken on a ridge, then it dips down where the homes are located and then the mountain rises up again. That makes sense and of course with time stuff does change...... I am sure there is some military historical map that will give me a better clue about the beach location as I know the general area, but would like to have a better idea. The other part that is obvious is that when you are visiting a town, you visit the historical places, and when you are a military person, those places tend to have military importance...so it fits that a young GI would take pictures of an area that had historical significance. Later I am going to Google earth so I can see the terrain. I think this is pretty amazing!!! THANK YOU !!! You're right, the angle is different and - funny your message should come at this moment - I just put up a fifth reasoning page indicating that very issue. Take a look again and go to the 5th image. Futenma would be just to the right (east). Susan, this was a lot of fun and I'm delighted to have been able to help. Ya know, Tom might just slap his head and say, "That's RIGHT! That's where I was!" You're a real peach to do this for him and I hope he enjoys it as much as you are enjoying doing it for him. Give my best to Tom! Mick makes total sense!!! It would have to be on a relatively high point and the picture you are using is good, the angle is just different. He is going to be so excited and I think if I Google this with the correct angle it will be right on. On Google there are a few parks at Urasoe just south of Hwy 330 . Perhaps those would be the "high" spots to take an awesome picture! I will also scope out the places just a bit more to the east. Google earth lets you visualize at different angles so I should be able to pinpoint it. From Susan Silva: Tue, 24 Apr 2012 18:45:38 +0000 I've shared a map with you called University of Ryukyus : You can view and edit this map. From a Facebook reader at "Yeah... I Lived in Okinawa" group, Tuesday, Apr 24, 2012, 2:38p.m. 'David G' says, He would be close to the Shuri area. 'Mike' says, My wife is from Itoman and I spend a lot of time on the Southern part of the Island and this doe's not look familiar. It does look like it might be in Yomitan though. Assuming the cameraman is facing South and the ocean is to the cameraman right. I spent two tours as a civilian worker there, first from 1999 to 2004 working for the Army Corps of Engineers - first at the office in Urasoe and later moved to a new facility at Camp Foster. Was there again from 2005 to 2009 with the DPW at the Army garrison at Torii Station. Beautiful place, wonderful people, fantastic food...miss all of it so much! Date: Tues, 8 Mar 2011, 12:10p.m. I was a Vet Tech stationed on Okinawa at Camp Mercy Vet hospital. I had Vet Tech friends at both Machinato and Yomitan dog schools as well as the 267th Chem Co. I accompanied dog handlers to JWTC (part of Marines camp S.D. Butler). I was on Okinawa from May 1968, through Dec. 1969. I would like to know if any of the dog handlers remembers the Vet Clinic at Camp Mercy. I lived on the rock from Jan of 67 to June of 68. Stationed at Naha Wheel with the 412th Transportation CO. Went to Nam on TDY from May of 67 to June of 68 then back to Okinawa and then home at the end of June.Someday I would love to return to Okinawa but don't think that I will make it. I had many good times and met some great people. It's been almost a year since I stumbled onto your great site while googling for Gordon Warner's obituary. You may remember our later exchange regarding "karatachi". Tonight I was Googling for my wife's Okinawan friend, Hirai Junko, and discovered him hiding in plain sight on one of your pages that I had missed before. Mieko had heard on NHK news today a reference to Hirai-san's having received recognition as one of Japan's top five contemporary photographers.....or something of that nature...and I was trying to see if I could find anything in English. No luck, but I did find that you were impressed with two of his books. Mieko graduated from Nago High School with Hirai in 1957. (He was from a southern island but had been sent to high school in Nago.) He is outgoing, has a fine sense of humor, and is a delight to be with. Several years ago, he was one of five classmates (two men and three women) who visited us for almost a month. We did D.C. and Virginia, of course, but also drove to New Orleans and later to New York. Hirai-san led many sing-alongs as we traveled. We thoroughly enjoyed their visit. We have several of his books, and I'll have to get Mieko to see if she can add any helpful translations (probably nothing extensive). We had New Year's greetings (and a packet of high-school reunion photos) from Hirai within the past week. I think I have his email address, but his English is only a bit better than my pitiful Japanese. Belated Happy New Year to you.....and continued appreciation for your most interesting site. I was in the invasion of Okinawa in winter of 1945. Stayed in area till Sept 1st then we went home to the States. In 1963-1967 I was in Okinawa as a civilian contractor. I was in on building dependents housing at Kadena airbase, Naha navy base and Camp Foster marine base but I can't remember the name of the army base houses. My office and factory was in Machinato across street from Pac Air company and kitty corner of the Korean Cafe. For a year I lived at the Central Hotel near Kadena base. Bought a few motorcycles from a little shop near the Pizza House, top of hill on way to Kadena air base. It was a wonderful 3 yrs there. I have lots of fond memories of there. Probably left a few kids there in that time era too. My cousin was attached to USCAR on the island. I did not know that till I was on the island for 6 weeks or so. He was a very important man there. Good to know. He had a military plate in single digits. Thanks for your time. As you must realize by now I am in my mid 80's. Was in service from 12/8/1941 till 11/29/1955. It's very good to hear from you. Thank you for visiting ClickOkinawa.com and for sending your message along. Please forgive me for taking so long to reply. I also thank you, sincerely, for your service to our nation as you participated in the invasion of Okinawa. I am confident that you know very well how important a contribution you and your comrades made to the war effort and especially for being a part of the final battles of WW II. Without your efforts and sacrifices, who knows how things might have turned out. I used to live in the Army housing area at Machinato when I was stationed on Okinawa in the mid-1970s. When I went back in the 1980s I lived on the Yomitan (Yontan) Peninsula for a couple of years, near Torii Station. Then I lived on Kadena Air Base for a couple more before leaving the island in 1990. I could only take a guess at the other Army base you referred to but can't remember... was it Chinen? That one was way down on the southeast end of the main island. Fort Buckner was another one that was further north but south of Kadena. Camp Kuwae (Kue) was another - that is now Camp Lester and the Navy now runs the old Army hospital that was at Kue. Torii station is the only other Army base I knew of - at least that I can remember now. I'll bet you had one heck of a time during your years on island, Bob. If you have any photos or other stories to share, please send them along and I'll be delighted to get them posted on the website. Wednesday, September 8, 2010 5:25p.m. Mick, I�m certainly interested in anything about Okinawa. We communicated several months ago via the web, somehow I got your library site and knew I had to keep you in my back pocket�. I lived in various areas of Okinawa with my parents , Pat and Kit Patterson during 2nd,3rd,4th grade in 1959-1961. The article about the turtleback tombs was fascinating. I remember living in Awase Meadows above the �monkey jungle�, hanging out with my buds and my favorite dog Poochie. Exploring was our favorite thing to do. We would quietly hide in the bushes on the hill across from the tombs . When a family member died they would push away the heavy concrete block door and place the fresh body (rolled up in a rice mat) into the tomb. Then I remember once a year the whole family would gather around to polish the bones and put them in the urn-vases. We were really excited to �happen upon� these events . We knew we were probably the only ones in the world who had ever seen such a thing!...kids anyway�.I thought the tombs looked like gigantic three-leaf clovers. When I went to southern China in 1986 once again I saw the same style tombs, while hydroplaning from Hong Kong. Now your article----I love it. Thanks for verifying my treasured memory. Wednesday, Sep 8, 2010 11:29a.m. Thank you very much for visiting ClickOkinawa.com. I'm delighted that you are, so far, enjoying the website. I've tried (and continue to try) to make this a fun, informative and reflective place to visit. Please get back with me some time after you've had more time to peruse the entire website and let me know any questions or suggestions you might have to make it even better. So, when were you on Okinawa? Tell me a little (or a lot) about your experience. Came across your website and saw that one of your DVDs (number 5) contains footage of Aka Inu Ko Restaurant. Can you tell me what year that was from? Thank you for visiting ClickOkinawa.com and for sending me your message. The footage of one of our many visits to the Aka Inu Ko was made in 1989. Wednesday, Sept 8, 2010 4:26p.m. Thanks for writing back. I've been trying to figure out when Aka Inu Ko Restaurant was sold by my family. I think we still had it in '87 but for sure when I went back in '91, it had already changed hands. My aunt owned and ran the place from the early-1960s (possibly even the late-1950s) until the mid-'80s. My mom, other aunts and various cousins worked there in some capacity, including me when I would visit from L.A. as a youngster. When my aunt went to the mainland, my cousins took over for a short while but ended up selling it. There was also a little coffee house adjacent to Aka Inu Ko that another aunt ran (actually, it was a bar for a long time and then in the early-'80s, it was a coffee house). I've got many fond memories of that little stretch of Route 6 including meals at the Royal and Azuma. I may have to purchase your DVD just to see the inside of Aka Inu Ko again because once it changed hands, I was pretty much told by all my cousins that it was too sad for them to go back there. Guess I can understand why. And who knows? Maybe you and your family went in when my cousins still ran it, though I doubt it. Is PayPal easiest for you or do you accept personal checks? Wow! What a treat to hear from you. Aka Inu-ko was one of our favorite places to have a good meal. How did it come to have the name "Red Puppy"? We lived in Aza-oki for two years, 1986-1988; in fact, having just put that in perspective I think it's more likely that my video may well have been during that time instead of my first impression that it was 1989. In 1988 we moved onto Kadena Air Base until we left at the end of 1990. Even after moving on base we still went out to Yomitan often and went to all the places you mentioned; Aka Inu-ko, the Royal Hotel (where we'd go upstairs for a meal), the Azuma and, out on HW-58 the little taco place. I can't remember the name of that one. The Azuma, I think, was the little restaurant on HW-58, right? On the right as you left Kadena Circle going north? I think that was the name of that place. I liked their soki-soba and the neopolitan spaghetti. Did you ever go to the Mont Blanc restaurant in Koza (Okinawa City)? It was on a small street that connected Gate 2 Street and Chuo Park Avenue (the old BC Street). It was the same street that had a small clothing store, Saly's. There is a mostly forgotten Yomitan legend about a little red dog (let's just pretend it's a Ryukyu Inu) who was known for his loyalty. I don't know all the details but it's got some similarities to the Hachiko story except it allegedly took place before Hachiko. If you take the little road (beside the commercial strip where Aka Inu Ko is located) that goes into the hills, eventually you'd get to a small non-descript shrine dedicated to the red dog. We used to play up there as kids (guess I like shrines to dogs as I recently went to see Grey Friar's Bobby in Edinburgh). The funny thing is I remember thinking the legend had something to do with the red dog's tail! But through our discussion, I've come to realize they meant the TALE of the red dog and not the tail of the red dog. Duh. Only took me thirty-odd years to figure that one out. I believe Azuma was next door to Aka Inu Ko if not a couple of doors away. If you crossed the road, you'd be at Royal. Either that or we were filling ourselves with self-serve soft serve ice cream at a restaurant that I thought was Azuma but wasn't. My cousins and I would walk in when we were kids and just make ourselves cones and walk right back out to go back to Aka Inu Ko. I'm assuming the adults settled with each other later. At least I hope so or I owe some money to the owners of the restaurant I always thought was Azuma. Don't think I ever went to Mont Blanc in Koza (it'll always be Koza to me) but I checked out a Peruvian restaurant on BC Street (or Chuo Park Ave.) when I was there last. I remember the little taco place on Hwy. 58. Haven't been back in 19 years but I've seen pics from my folks' trips and from rellies. My, oh my, how things have changed! I'm hoping to go next year for the 5th World Uchinanchu Festival. Thanks very much for the opportunity to reminisce. Believe it or not, I just heard another version of the story from my mom. A long time ago, Okinawa was having one of its droughts. This red dog who belonged to a woman would go out wandering and come back later. The woman noticed the dog would often return with its coat wet, so she followed the dog and the dog led her to a source of water which was located somewhere on what we now know as Torii Station. My mom says she heard the Okinawans refer to the water as a lake but she added that it wasn't really a lake. It was a tunnel which led to a source of water underground, so I'm guessing a well of sorts. You know how these stories get sketchy over time. I have no idea which one is true but the first story (about loyalty) I told you came from my dad who said a villager told the GI's that version. The second version is from my mom who's a native Uchinanchu. Oh, and my mother also said that the shrine, which I was always told was for the dog, was actually for the school that was there before Yomitan Airfield was built. My folks are getting on in years and dealing with terminal illnesses, so neither is probably the most reliable source. I imagine somewhere between the two [there] lies the truth. Got the DVD. Thanks for such a quick delivery! It was cool to see the restaurant after so long. Those partitions in the tatami seating area were new to me and the configuration of the tables in front of the tatami/tv area were a bit different. The first time I ever saw Speed Racer was in that room (of course, it was in Japanese). LOL That was my cousin-in-law [name removed] who served you at Aka Inu Ko. Couldn't really tell who the other two ladies were in the kitchen but the one on the left was probably an aunt (married to one of my mom's many brothers who was a tofu maker - chances are the tofu your family had was made by my uncle in the Toya part of Yomitan). In the late-'60s and through much of the '80s, Aka Inu Ko was known for its bento lunches, soki soba and fried chicken. After my aunt left, I'm not sure how the food was, but throughout my childhood and teen years, I remember a stream of workmen coming in to pick up their bento boxes and bowls of soba and plates of fried chicken coming out of that kitchen during the lunch and dinner rush. Those are my favorite kinds of eateries in Okinawa, nothing pretentious, just simple homestyle cooking and a laid back atmosphere. It was admirable of you and your family to get out and about and go to places that the locals go to. A lot of our military don't do that and they miss out on some unique and rich experiences. If you're ever in SoCal and you need an Okinawan food fix, I know a restaurant in the South Bay that makes a pretty good soki soba (in fact, it may be the only restaurant in the entire L.A. area that serves it). Thanks for the opportunity to re-visit the past, Mick. Take care. Thank you, Xxxxxx, for letting me know that the DVD arrived. I'm happy that you did actually recognize someone too! 1. the different configuration of tables relative to the TV - I think that diners were pretty much allowed to move things around at their will because we would notice from time to time that things were changed around from a previous visit. On one occasion, a group of young people (I think they were Taiwanese tourists as they weren't speaking Japanese or Okinawan dialect, and their dress was "foreign") were themselves rearranging tables, etc. when we walked in. 2. admirable of my family to go to places the locals went - Hope, that was our most important and rewarding decision! After about 6 months of being back on the island, I had been to all the "tourist traps" on the island that I could come up with and then, after exhausting those destinations (where we put up with crowds of Americans, many of whom acted like they owned the place) decided to venture into areas outside of my (then) comfort zone. It didn't take long for me to learn that the vast majority of Okinawans, of all ages, were more than happy to have us in their midst. Many went out of their way to accomodate us in our quest for understanding the mystery of their villages. I must admit that I went out by myself most weekends. My wife had more trouble overcoming her fear of being perceived as rude or out-of-line going into places that were, in her opinion, too personal or too invasive of their privacy. I couldn't convince her that we would be perceived (and received) based mostly upon our behavior and sincerity. I soon learned to never be afraid to go ANYWHERE! Actually, there were places I was reluctant to go and it was 100% based upon the population of AMERICAN military members who pretty much took over certain areas. I'm confident that you know what I mean. During our first tour on island (1972-75) there was an area of Koza called "The Bush" where no caucasian in his/her right mind would go. It wasn't all just black vs. white though. Other areas were just plain full of criminals of all stripes. But I digress.... I never feared rebuke by Okinawans and more times than not I was accomodated beyond anything I'd have wished for. One day I was driving through a small village. It intrigued me and I decided that I needed to experience the place in a way greater than simply driving through would have allowed. I parked my van and got out and walked through the village. One old man who was busy manually preparing his small field with a hoe, set down his hoe, approached and greeted me. I explained (as best I could with my limited abilility to communicate) that I liked his village and asked what he thought would be something he'd like for me to see; something about his village that he was most proud of. We walked a short distance then went off the narrow road onto a path into the woods. We came into a very small clearing and he pointed to a tiny shrine. I have to admit that I didn't understand most of what he was telling me but it had something to do with how some U.S. Marines had done something helpful for his family during the Typhoon of Steel. It was very moving and I wish I had, 1. understood everything he was telling me, and 2. the videotape of that encounter. Sadly it was among those videotapes that were "lost" when I shipped back to the States. After that tour we walked back to my van and I took a couple of Cokes out of my omnipresent cooler; we sat on the rail of a small bridge and drank together. Then, as abruptly as he had set down his hoe, he was on his feet and rushed back to his field to get back to work. I felt like I had contributed to him having not got as much work done that day as he might have planned. I asked if I could help and he politely said no. I tried anyway, walking around collecting the weeds that he had dug up and thrown to the perimeter of his small field. I made a couple of passes at the weeds, collecting them and setting them in a pile at one end. He apparently had had enough of me because he came over to me, took what weeds I had in my hands and threw them back to the side. He then thanked me but chastised me gently as I was doing the work that he intended for his son to do when he got home from school. Amazing work and family ethic. I appreciated the man all the more for that. When I finally left that little village I was sure that I had just experienced the most fruitful and rewarding interaction than ever I could have hoped for. I made two more trips to that village. The second one, he wasn't there. The third time I did see him and was prepared. I had brought along a couple of Bento-no hako and, of course, more Cokes. We had a delightful lunch, a wonderful visit and then, as anticipated, he sent me on my way so that he could do his work. He most certainly is one of God's favorite people. 3. A lot of military members don't get out and in so doing miss out on riches and rewards - you are absolutely correct, and it was absolutely THEIR loss. Some people just think that "if it ain't American it ain't worth seeing." Well, too bad for those who have that mentality. They are clearly major LOSERS! I cherish my years on island and hope to get back there one day - after I have fonally retired for good and can spend as much time there as I want. Who knows... I might never want to come back!! ha! (I am) Wondering if you could help me post a question. I am helping my girlfriend look for her birth mother. She was born in the Kadena Military Hospital and then adopted by missionaries in March 1961. She is turning 50 this year, and would like to find her birth mom, and her own parents would like to meet the mom they never knew. She only has her baby bracelet and has written to the ISS organization but they claim to have no record of her birth and the name on the bracelet has faded. She only sees the mom's name, Vivian. I am wondering if ANYONE was born in that hospital at that time if they could provide a copy (with their name and info deleted) of their original birth certificate form just so that we can see what it looked like. Maybe there is a reference number, agency, stamp... something that will give her a clue to help the ISS locate it. She only has a copy of her baptismal and the parents say that the dad was there at the time of birth stationed on the AFB. Her parents are unable to find a copy as they traveled extensively and moved several times and are hoping that 'Vivian' is still alive. You mention the "ISS" organization. I'm not familiar with that. What is ISS? I am familiar with INS, Immigration and Naturalization Service. I wasn't on Okinawa the first time until 1972 so cannot attest to whether deliveries were routinely performed at Kadena; I think that most routine obstetric care was done at the Kuwae (Kue) Army Hospital. It is conceivable that the U.S. Consulate office on Okinawa could have records - they actually SHOULD maintain records of any American birth on the island. If your friend has not contacted the INS then I think she should. They might have information that would be helpful. Thank you for visiting ClickOkinawa.com and for sending your request. I was an Air Force Brat living on Okinawa from 1967-1970. My dad got orders to Kadena when we were stationed at Glasgow AFB, Montana. We lived off base for about 8 months in Kadena Circle about a block away from the sea wall and right across from the tombs. We quickly got a dog as the stories of Stealy Boys were too much for my mom and WANTED protection. Our house was the ONLY one in the area that hadn't been broken into, or at least tried. We always felt very SAFE and then we moved on base--BASE LIFE was WONDERFUL...so cool to take a taxi for like 25 cents to the BX. We were SO SPOILED!!! Kadena Karnival with the habu and mongoose fights...that was the ONLY time i ever saw them. THANK GOODNESS. Our house on base was right near some boonies so we know they were lurking out there and, oh, I do remember one time shortly before we left - our gardener had killed a habu but we never saw it. Our family had some of the BEST times of our lives on Okinawa. I guess having a 'sew girl', maid and gardener helped. Actually it was just the island we fell in LOVE quite quickly. My dad, mom and brother who was 4 years older than i...i was born in 1957. Oh how i LOVED the Pawn Shops and SHOPPING and bartering [ed: I think she meant "bargaining" or "haggling"] I did try that when i moved stateside, and my mom had to remind me "You aren't living on Okinawa." How true that was...WE NEVER THOUGHT WE WOULD MISS IT SO MUCH!! We spent a lot of our weekends taking tours sponsored by the USO going to places we never thought we would visit. Most of the time my brother and I were the only dependents on the tours. My folks wanted us to experience and see as much as we could when we were there. My brother was quite the photographer and the tours provided many WONDERFUL subjects for his award winning pictures! My dad was Sgt Major/First Sgt of the Dispensary at Kadena and we were there when the B-52 crashed. What a time that was - so MANY memories of our times on Okinawa. I so want to be able to VISIT again one day which will probably just be on a cruise in which we will dock at Naha where I didn't spend much time. I enjoyed reading your stories and looking around on your site. LOVE going back to a time in our lives where LIFE was simple and LIVING was GOOD. All of my family (dad is deceased) left a little part of us on the island and when we do 'visit' there in our memories sometimes it just doesn't feel like it was 40 years ago. All of us pretty much cried when my dad got orders to Hill Air Force Base, Utah. We were hoping they would extend his tour or at least maybe have a chance to go back. My dad retired in 1971 and we ended up staying in Utah. Thanks again for bringing Okinawa to those of us WHO MISS HER!! Sure is nice to hear from you, Janis! Thank you so much for visiting ClickOkinawa.com. I hope you have enjoyed your virtual return to the place that you (and I) do dearly love. I think that I might have added a couple of things since you sent me your message. I have added some links on my "Sounds of Okinawa" feature to some really great Okinawan music. If you didn't see/hear it before, go take another look! By the way, I hope that you'll forgive me for taking so long to get back in touch with you. I really don't ignore folks when they write in - I just sometimes take a while to get around to reading my email, sorting it out and replying. But today, my friend, is your turn! The habu were indeed something to ponder, eh? I used to go jogging in the evenings through my neighborhood in Stearly Heights, or sometimes off base. I had been doing that for about a year or so before I learned that habu hang out IN TREES and wait patiently for some unsuspecting prey to happen along. Lucky me. I did step out back one night though to let the cat in and he just stood there, looking at me but not moving a muscle. I thought that that was quite odd as that was not a cat to just stand around. I thought he was sick or something so I approached him, crouched in front and reached out to pick him up when, in the near pitch dark, I saw something move just off to my right. I leaned in for a closer look and just about pee'd myself when I recognized that it was a habu! Yikes!! I got a case of the Willies that didn't go away for danged near 2 hours after being safely back in the house. To this day I don't know why it didn't strike. I'm just happy it didn't. I, too, enjoyed some of the USO tours. Wish I'd have taken more video though. I went on a few tours and didn't even bring my camera. Duh! I do have some tour sequences though on DVD. If you're interested, check out the "Video Tours" on the website. I grew up an Air Force brat too but Dad had assignments in Europe. I never got to Asia until I was in the AF myself. Man-o-Man I am so happy that I didn't get European assignments. Asia is sooooo much better! Well, once again, Janis, I sincerely appreciate your having stopped by the website and certainly hope you'll come around again. Mick, I am thrilled to have found your website! I was a young girl; 7, 8 and 9 back in 1959-1961. My dad was in the Navy but worked for the Army. We first lived at Buckner Bay in a quanset hut, then moved behind it into a house. I would love to explore and sneak off into the village up the hill behind our house where our maid lived. Her name was Hedako. We brought her with us to Awase Meadows, our next house on a cliff. I remember well the whaling �operation� near the water at Buckner Bay and the atrocious smell. And do you recall those gigantic pearlie-purple snails that caused traffic jams? One didn�t dare run over one, lest he buy new tires. HA! We had a nice boat, my dad built it in the front yard and we belonged to the Okinawa Yacht Club. That was always great fun, especially the regattas and the weekends on Admiral�s Island. I can�t remember much about locations and where they actually were. It seems that many of the town names are Okinawan or Japanese and they don�t ring a bell. I would love to return to that lovely place of many memories to relive some of my childhood. My parents went to Hong Kong just before our time was up in OKINAWA in Sept, 1961. While there my 34 year old mother suffered a brain aneurysm and died 3 months later in Denver. I did go to Hong Kong just after turning 34 myself - another milestone in my life. My dad never did remarry [although] he came close several times. He later died in Gulfport at the Navy Retirement Home in 1999. Anyway, I�m on a mission to rediscover that far away land. I truly loved living there. Thanks for your fabulous list of books and summaries in your library. Yakota Officers Club was very familiar. If you can hook me up with any info on websites etc. I would greatly appreciate it. I hope that you found your visit inspiring and that you'll be back again and again. I envy your having lived on Okinawa before Reversion in'72. I didn't get there the first time until a few months after Okinawa had been returned to Japan. Many, many changes ensued. We're about the same age; I was 8, 9 and 10 in 1959-61. Your last year on Okinawa ('61) was my first year in France. Dad was stationed there and we spent three years living in a remote housing area with no TV or telephone. Okinawa was my second permanent duty assignment after having joined the Air Force. Even then, telephones off-base were all but unheard of. There were very few phone numbers available and people who could afford it were on a long waiting list. After moving into Army housing at Machinato we had a phone. Felt rich then! Ha! Television was the one channel (8) that was AFRTS - you probably remember FENO radio, huh? (Far East Network, Okinawa). I remember the quanset hut housing; in the mid-70s there were still some of those on Kadena. I was a three-stripe medic in those days and recall going to our chief nurse's house for a Christmas party. She was a LtCol and lived in one of those huts! Before moving to Machinato we lived in Awase, on the side of a hill overlooking Buckner (Nakagusuku) Bay. We were right off of highway 327 (or maybe it was 329) and I can't remember what the highway designation was back then. The old Highway One is now HW-58 and for the life of me I can't remember the old HW number for the east-coast of Okinawa. You commented on the atrocious smell near the Bay - I remember the terrible aroma on "Pig Farm Road" that ran through the northern part of Awase. Luckily our house was south of that area and we didn't get the stink! You and your Dad must certainly have had a very rough go of it after your Mom died. I'm sorry that your childhood was saddened by such a grave turn of events. Maybe it made you a stronger person in the long-run. My wife lost her Mom when she was 12. She had two older sisters and a loving father to look after her and she had a younger brother over whom she took the task of protecting. I think a lot of her strength and compassion was a necessary result of her loss. You commented, "If you can hook me up with any info on websites etc..." What in particular, Nancy, are you looking for? I'll be happy to help to whatever extent I'm able! Thanks again for visiting and for sending me your message. Please visit often! I found your page by accident when I was doing research to substantiate a disability claim. I was in Camp Kuwae Hospital in March 1968 for a couple of weeks. I was stationed at Naha AFB as part of the 30th ARTY BDE (ADA) and lived near the main gate to the Machinato housing area. While I was in temporary quarters I lived near the very top of Kakazu Ridge. It was the site of much bloody fighting in WW2 and was a lonely, spooky area at night. One especially quiet and spooky night, with a mournful wind sighing over the ridge, I heard a tapping at my window. I looked up into the face of a world war two Japanese soldier! Or so I thought, it was just the local "home security" representative, wanting to sign me up as a client! But I swear, at first glance, he looked like a Japanese soldier, right down to the uniform! I really enjoyed my pre-reversion time on the island. I understand that it is a bit of a tourist attraction these days. Thank you very much for visiting ClickOkinawa.com and for your message. Sounds like you had a pretty good time in pre-reversion Okinawa. As you may have read, I was there a few months after reversion having arrived in the Fall of 1972. I left in '75 and then had the great privilege of going back again 1986-1990. I retired soon upon my return to the USA and, sadly, haven't been back to Okinawa since 1990. I lived in "Machinato" housing 1974-75 and remember how much construction there seemed to always be just across the fence on Highway 58 (old Hiway One). By the time I got back in 1986 the south of the island was hugely overpopulated and much, much more construction had occurred. The old Machinato (it's called Makiminato now) housing area had been given back to Okinawan land-owners prior to 1986 and when I went back it was for the most part in poor, run-down abandoned condition. A few of the land-owners either lived or rented out some of the old houses. Among a field of overgrowth, weeds and broken down, deteriorating houses you would drive around a corner and come upon a well-kept yard, nice lawn, hearty shrubberies, reconditioned and decent-looking house where one of them made their home. I never could find the old chapel, school or commissary so those must have been razed. Or, perhaps I just didn't find them. Your story of looking up to your window and seeing the face of a Japanese soldier reminds me of a night at our old house in Awase. Back in the 70s I was an Emergency Room tech (medic) and worked nights. My wife was at the house in Awase one night, taking a shower (and there was a small window in the shower that looked out into the back yard) when she turned and saw a young Okinawan peeking in the window. It scared the heck out of her and to this day I still occasionally hear what a doof I was to work nights and leave her there by herself at night! When we went back in the late 1980s my sons were in the mid-to-late teens and we went one weekend with a group of Okinawans and mainland Japanese who once a year search through the caves where Japanese forces were holed up. We look for any artifacts; bones, dishes, materiel - anything that may have been left behind from when they occupied the caves. As you can imagine, by this time, 60-plus years later, there aren't many artifacts remaining but each year something gets recovered. Some of the caves around Naha, and especially Shuri and Kakazu were searched. A very interesting day it was! You were in the Kuwae hospital - as a patient? How was that experience? Both of our sons were born in that hospital, in 1973 and 75. I never worked there as I was Air Force and they were Army. When I went back in 1986 however, working then as a PA I did get to Kuwae once in a while. The Army gave the place over to the Navy sometime in the early 1980s and it's now the Camp Lester Naval Medical Center. Since Clark Air Base closed in the Philippines, Lester has become one of the medical meccas of the Pacific theater. Of course, Hawaii is still "the" major center for PACAF. The neonatal ICU used to be at Clark and that moved to Okinawa along with many other specialties. You were at Naha AB when it was in full swing, huh? The last several months of my first tour I spent at the Naha Clinic. By then most activities at Naha AB were closed down but there were still a few organizations operating out of the base. The housing area was empty and much of the base proper was abandoned. As a E-4 "Buck" sergeant medic I was tasked with operating an "aid station" in the old clinic building. I had one other tech, an administrative airman and an Okinawan ambulance driver, Chogi. It was fun but seemed very isolated as Kadena was "way up island" as was the Army hospital. At Naha the Navy had a small clinic/dispensary with a real-live physician assigned so whenever I was in over my head I could call upon the Navy clinic and, contrary to popular belief, they were very accomodating. In fact, I got to know the doc pretty well and still think he was at least part of what inspired me to go back to school. I've now been practicing as a PA since 1978. Retired from the AF in 1990; did rural medicine in Chouteau County (north of Great Falls) for a couple of years before moving back to Great Falls where we set up a new clinic in town. Then, in 1993 I got "hooked" on the Air Force again and gave them another 15 years as a GS. I retired from that in Jan 2009 and am now doing a part-time civilian practice. So Naha Air Base and that Navy doc got me started on a pretty decent path. I'll always remember Naha AB fondly.